President Donald Trump speaks at Suffolk Community College, July 28, 2017, in Brentwood, New York. 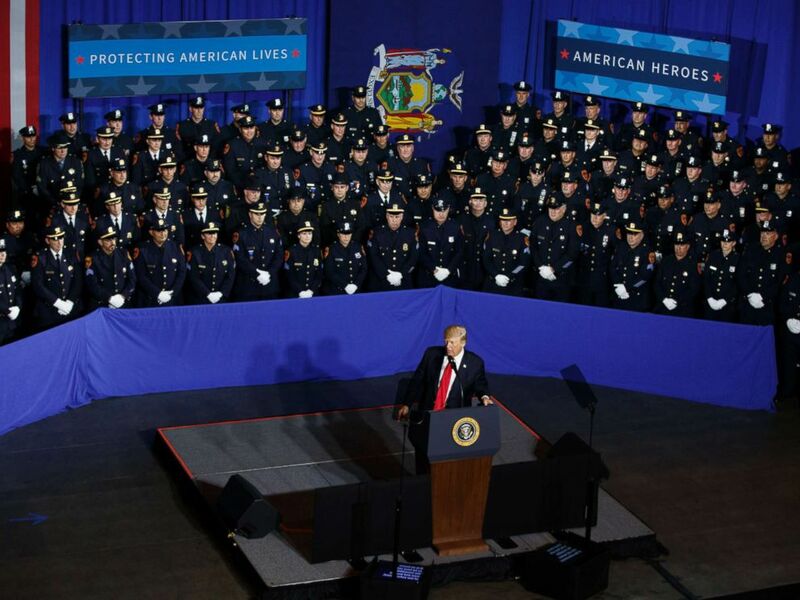 President Donald Trump seemed to encourage police to be more violent in handling potential offenders during a speech to law enforcement officers today. "Please don't be too nice," he said to the audience in Long Island, New York. While the speech was largely focused on the fight against the gang MS-13, it appeared that Trump was directing his comments about police interactions with suspected criminals in general. He described the precautions typically taken by police where they place a hand over a suspect's head while they're being put into a police car to protect them. "When you see these thugs being thrown into the back of a paddy wagon, you just seen them thrown in, rough. I said, ‘Please don’t be too nice,’" he said. "I have to tell you, you know, the laws are so horrendously stacked against us, because for years and years, they've been made to protect the criminal. Totally made to protect the criminal. Not the officers. You do something wrong, you're in more jeopardy than they are," he added. At one point during the speech, he seemingly praised the perceived toughness of U.S. Immigration and Customs Enforcement officers. "I can tell you, I saw some photos where [acting ICE Director] Tom [Homan]'s guys, rough guys, they're rough, I don't want to ... say it because they'll say that's not politically correct, you're not allowed to have rough people doing this kind of work. ... Just like they don't want to have rich people at the head of treasury," Trump said. President Donald Trump speaks to law enforcement officials on the street gang MS-13, July 28, 2017, in Brentwood, N.Y. The Suffolk County Police Department, the county in which Trump spoke, tweeted about its policy on handling prisoners -- although it did not specifically cite the president. "The SCPD has strict rules & procedures relating to the handling of prisoners," it tweeted following the president's speech. "Violations of those rules are treated extremely seriously." A subsequent tweet read, "As a department, we do not and will not tolerate roughing up of prisoners." The American Civil Liberties Union also responded, condemning the president’s remarks. “By encouraging police to dole out extra pain at will, the president is urging a kind of lawlessness that already imperils the health and lives of people of color at shameful rates,” Jeffery Robinson, deputy legal director at the American Civil Liberties Union and director of the ACLU’s Trone Center for Justice and Equality, said in a statement. “Innocent until proven guilty? Our president would rather not bother with that, expanding the role of the police officer to include judge, jury, and executioner,” he said. “This country is weary of the type of policing that Trump espouses, having seen over and over again that it only makes it harder for police to investigate and solve crime,” he said. This isn't the first time that Trump has seemingly condoned physicality. During a campaign stop in Cedar Rapids, Iowa, on the day of the Iowa caucuses, for instance, he told audience members he would pay their legal fees if they engaged in violence against protesters. A similar situation unfolded at a rally that month in Warren, Michigan. "Get him out," he said of a protester. "Try not to hurt him. If you do, I'll defend you in court. Don't worry about it."